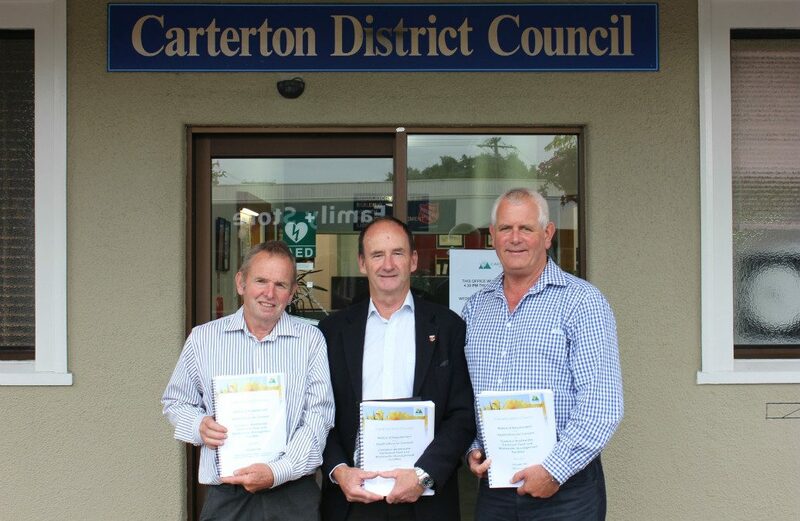 Today we are submitting our resource consent application for the Carterton wastewater treatment plant upgrade to the Greater Wellington Regional Council. Our application is for the treatment and disposal of wastewater primarily onto the Daleton farm, for a 35 year term. Our upgraded system is designed to meet the significantly increase environmental standards that we are all required to meet across New Zealand. Our objective is to put in place a regime that minimises the discharge of effluent to Managtarere Stream and achieves swimmable water flows downstream of the discharge point. View the Resource Consent Notice here. Left to right, Councillor Mike Ashby, Project Manager Greg Boyle, Mayor John Booth.